At SABR 44 on August 2, 2014, in Houston, Texas, the From Playing Field to Front Office Panel discussed the unique experiences of three baseball lifers who all began their careers as major league players and moved into the executive realm. They also shared a few humorous Yogi Berra stories, too. 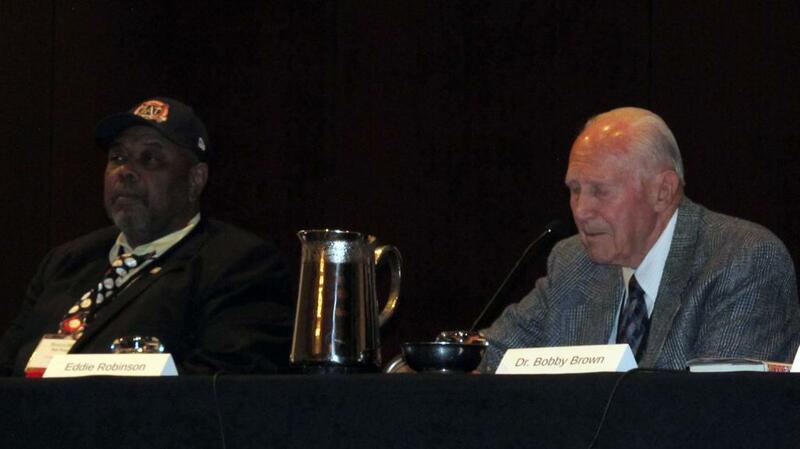 Our panelists included Dr. Bobby Brown, a New York Yankees third baseman who played on five championship teams, retired at age 29 to become a cardiologist, and later served 10 years as American League president; Eddie Robinson, who spent more than six decades in professional baseball as a player, coach, scout, farm director, and general manager; Bob Watson, who spent 19 seasons in the big leagues and then served as GM of the Houston Astros and New York Yankees; and moderator C. Paul Rogers III, an author, professor of law at Southern Methodist University, and president of the Ernie Banks-Bobby Bragan SABR chapter in Dallas-Fort Worth. Watson: "I was pitching in batting practice in Atlanta in the late '70s, and Bill Lucas — who was serving as farm director, general manager, but not having the title — said, 'What are you going to do once you finish playing?' Well, I hadn't thought about it because I was still in the middle of my career. And he said, 'Why don't you think about coming upstairs and helping put teams together?' That was it. I retired in 1984 in Atlanta, and … I went to Oakland. Sandy Alderson was the general manager. In that interview, he asked me what was my ultimate goal. I'm interviewing for the hitting coach job. And I told him, 'I want to sit in your chair.' And he said, 'You know what, I'll help you.' … So that's how it started for me." Robinson: "I always wanted to be in the front office when I was through playing. And I remember talking to Lee MacPhail when I was with the Yankees and telling him of my desire to be in player development. … And I had a champion in Paul Richards, who was my manager in Chicago, and he knew I wanted to stay in baseball. He was my mentor. 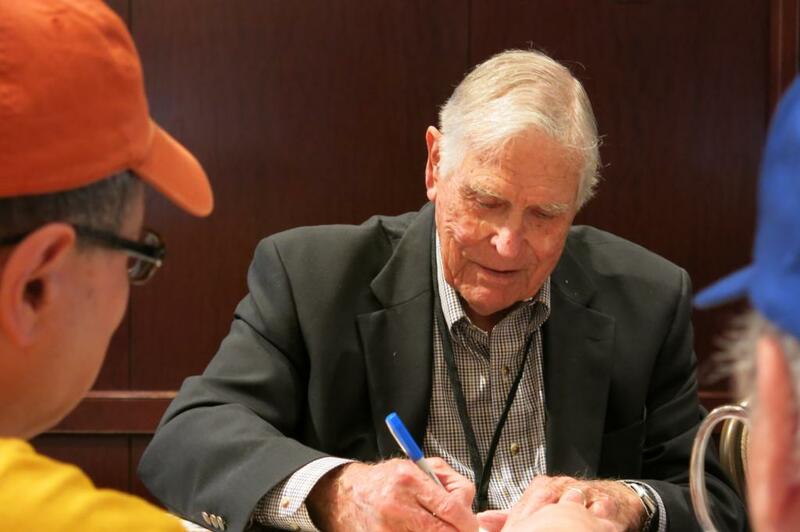 He was manager of the Baltimore Orioles and I wound up my career with the Orioles, and he gave me a job in the farm department. In 1961, we came to Houston when they didn't have a team. I didn't know what we had here, but it turned out to be a good one." Brown: "Being in the executive office of baseball, it wasn't even a remote thought. I graduated from medical school in 1950 and went on to play a couple more years. … In 1974, one of my friends bought the Rangers, Brad Corbett. He did not have any experience in baseball. And I helped him a little bit, then I went back to my practice … Then in 1984, I was turning 60 and I had been practicing [medicine] for 25 years, night and day, and I was getting tired, and I knew I could go another five years but not any longer than that. But here was a baseball thing. So I said yes and went up for an interview. They wanted a business man for the commissioner's job, and I said I don't qualify for that, but they then turned to me and said Lee MacPhail was retiring from being president of the American League. So I asked Lee and he said, 'It's a great job, it's a baseball job. It's better than the commissioner's job.' So I said, 'I think I'll give that a whirl.'" Brown: "I roomed with him in Newark, and his education, you might say, was very spotty. I felt that he was going to have to do well in baseball and stay in it for as long as he could. … He took my advice, he never had another job and stayed in baseball his whole life, and was a tremendous success." Watson: "Yogi was very instrumental in helping me in the postseason. When I got to New York, I asked Yogi, 'How do you handle this?' He said, 'It's like playing in your backyard. ... I tell you what, though, when they call your name and you go out on the line, your knees are going to be shaking and your stomach is going to be boiling. But all that goes away once the game starts. When they hit the ball to you, you catch it. When they throw it to you, you hit it. It's like playing in your backyard.' I said, 'Yogi, is that what you did for all those years when you were in the World Series?' He said, 'Yeah, I have 14 World Series rings. I did pretty good, didn't I?' I said, 'Thank you, Yogi.'" This page was last updated August 15, 2016 at 8:53 pm MST.